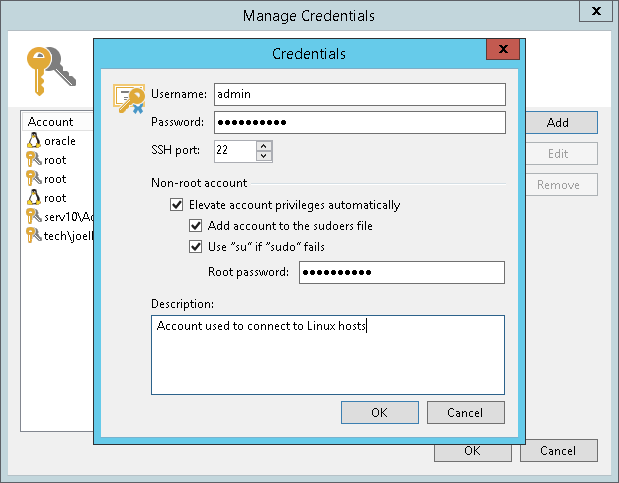 You can create a credentials record for the account that you plan to use to connect to a Linux server or VM running Linux OS. From the main menu, select Manage Credentials. Click Add > Linux account. In the Username field, enter a user name for the account that you plan to add. In the Password field, enter a password for the account that you want to add. To view the entered password, click and hold the eye icon on the right of the field. In the SSH port field, specify the SSH port over which you want to connect to a Linux server. By default, port 22 is used. If you specify data for a non-root account that does not have root permissions on a Linux server, you can use the Non-root account section to grant sudo rights to this account. To provide a non-root user with root account privileges, select the Elevate specified account to root check box. To add the user account to sudoers file, select the Add account to the sudoers file automatically check box. In the Root password field, enter the password for the root account. If you do not enable this option, you will have to manually add the user account to the sudoers file. When registering a Linux server, you have an option to failover to using the su command for distros where the sudo command is not available. To enable the failover, select the Use "su" if "sudo" fails check box and in the Root password field, enter the password for the root account. In the Description field, enter a description for the created credentials record. As there can be a number of similar account names, for example, Root, it is recommended that you provide a meaningful unique description for the credentials record so that you can distinguish it in the list. The description is shown in brackets, following the user name. You can create a separate user account intended for work with Veeam Backup & Replication on a Linux-based VM, grant root privileges to this account and specify settings of this account in the Credentials Manager. It is recommended that you avoid additional commands output for this user (like messages echoed from within ~/.bashrc or command traces before execution) because they may affect Linux VM processing. Cases when root password is required to elevate account rights to root using sudo are no longer supported.